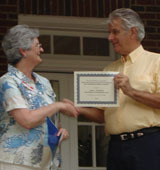 Baylor>TOHA>Awards>Community History Award>Historic Waxahachie, Inc.
On Sunday afternoon, August 19, 2007, at HWI's annual ice cream social, John Hamilton accepted from Lois Myers the award certificate recognizing the Ellis County Oral History Project. 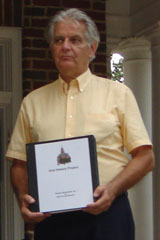 John Hamilton holds book of transcripts from the Ellis County Oral History Project. The Texas Oral History Association has awarded Mr. John L. Hamilton and Historic Waxahachie, Inc. (HWI), the Mary Faye Barnes Award for Excellence for Community History Projects for outstanding work on the Ellis County Oral History Program. The Oral History Project Committee of HWI and the Ellis County Museum, coordinated by Mr. John L. Hamilton, initiated the program, demonstrating from the outset a determination to use standard, time-tested oral history practices. HWI hosted an oral history workshop, taught by Rebecca Sharpless, then director of the Baylor University Institute for Oral History, and adopted three major goals: 1) to document an eyewitness account of the growth and development of Waxahachie, Ellis County, Texas; 2) to interview Waxahachie or Ellis County residents who could give first-hand accounts of daily life in Waxahachie; and 3) to collect information about Waxahachie which could be used for academic research or public dissemination. These goals would be reached through the creation of oral memoirs with a topical focus, although autobiographical information was considered a vital part of each interview. HWI formulated its interview agreement and arranged for repositories of its work locally at the Ellis County Museum, Ellis County Historical Commission, Waxahachie High School library, Waxahachie Global High School library, and Sims Library, and also regionally, at Baylor University. Trained interviewers used standard recorders, purchased and owned by HWI. Informed consent was an important component of all relationships with interviewees. Interviewers told narrators about the project and the ultimate deposit of the materials for research, education, or interested reading. Both interviewees and interviewers signed the agreement forms, donating all rights in the recordings to HWI. Some of the interviews have filled gaps in the historical record. For instance, the museum had no information about the Civilian Conservation Corps stationed in the area from 1935 to 1942 to assist with erosion control and soil conservation. An interview with a former CCC worker at the Waxahachie camp helped complete many missing details. Similar interviews have shed light on a former cotton mill, a 1929 jail, and the courthouse square. Additional interviews cover the experiences of local residents in picking cotton, serving in World War I, teaching, and promoting historic preservation. HWI was especially fortunate to have a volunteer transcriber for their recordings. HWI has been faithful to deposit their transcripts in the designated repositories, and the local newspaper has published stories based on the interviews. This project, therefore, met fully all the criteria for the Mary Faye Barnes award. In its spring 2007 meeting, the TOHA Board of Directors voted unanimously to present this project its award for excellence in community history.